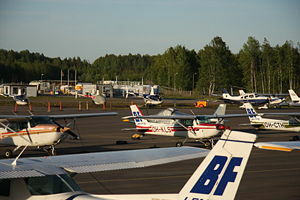 Picture - General aircraft at Helsinki-Malmi Airport airport, Finland. General aviation (GA) is one of the two categories of civil aviation. It refers to all flights other than military and scheduled airline and regular cargo flights, both private and commercial. General aviation flights range from gliders and powered parachutes to large, non-scheduled cargo jet flights. The majority of the world's air traffic falls into this category, and most of the world's airports serve general aviation exclusively. 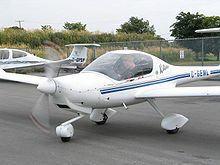 Picture - A Diamond DA20, a popular trainer used by many flight schools. General aviation covers a large range of activities, both commercial and non-commercial, including private flying, flight training, air ambulance, police aircraft, aerial firefighting, air charter, bush flying, gliding, skydiving, and many others. Experimental aircraft, light-sport aircraft and very light jets have emerged in recent years as new trends in general aviation. Most countries have authorities that oversee all civil aviation, including general aviation, adhering to the standardized codes of the International Civil Aviation Organization (ICAO). Examples include the Federal Aviation Administration (FAA) in the United States, the Civil Aviation Authority (CAA) in the United Kingdom, the Luftfahrt-Bundesamt (LBA) in Germany, and Transport Canada in Canada. Since it includes both non-scheduled commercial operations and private operations, with aircraft of many different types and sizes, and pilots with a variety of different training and experience levels, it is not possible to make blanket statements about the regulation or safety record of general aviation. At one extreme, in most countries business jets and large cargo jets face most of the same regulations as scheduled air transport and fly mostly to the same airports. Commercial bush flying and air ambulance operations normally do not operate under as heavy a regulatory burden, and often only use small airports or off-airport strips, where there is less governmental oversight. Picture - The General Aviation Terminal at Raleigh-Durham International Airport. Terminal 1 is in the background. Aviation accident rate statistics are necessarily estimates. According to the U.S. National Transportation Safety Board, in 2005 general aviation in the United States (excluding charter) suffered 1.31 fatal accidents for every 100,000 hours of flying in that country, compared to 0.016 for scheduled airline flights. In Canada, recreational flying accounted for 0.7 fatal accidents for every 1000 aircraft, while air taxi accounted for 1.1 fatal accident for every 100,000 hours.